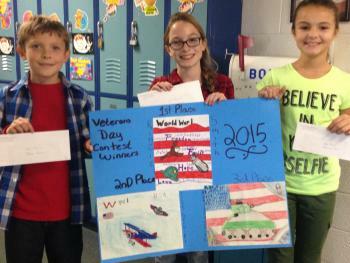 The CHS and CJH Student Council each held art contests for Veterans Day. The following Park Road students were recognized as the junior high drawing contest winners: Avery Vinson, Kodie Vega, Ethan Stone, Paige Navarro, Alexis Jones and Ericka Russell. The following Park Road Students were recognized as the high school poster contest winners: Trever Spruill - 2nd place, Kenzie Smith - 1st Place and Aunisty Smith.